Hello! I'm Erin from over at Thanks, I Made It. I love fashionable DIYs, and especially love making jewelry to create luxe looks for less. I was so excited when Rebecca asked me to guest post here on My Girlish Whims today. 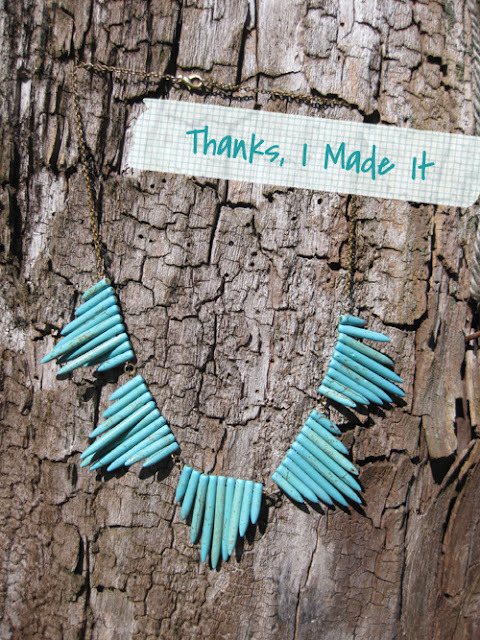 She has some awesome tutorials, and is a talented jewelry maker. Check out this DIY tutorial from my blog, and be sure check out Thanks, I Made It for more DIY fun! Fall here in New York was off to a very wet and grey start, so I had to create my own sunshine. 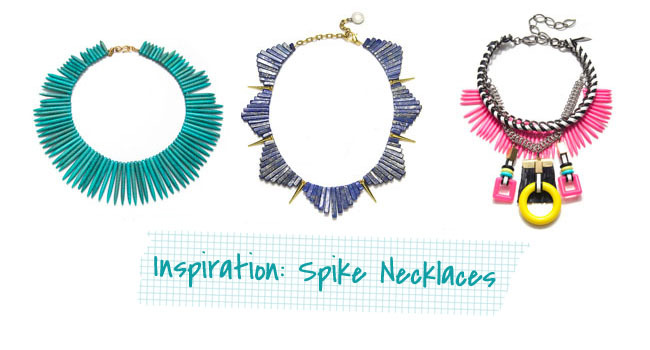 What better way than colorful rays from a spiky necklace? The necklace from Gemma Redux, above, uses stone fan pendant beads. I tried making some of my own beads of this shape with polymer clay... but things looked a little wonky and they now RIP in my graveyard of botched projects. I found a strand of spiky turquoise beads at a bead store for about 15 bucks and had all the other supplies, so it was a cool $400 less than buying the real Gemma Redux deal. First, organize the beads to create triangle sections, like below. Slide beads onto an eye pin. Trim the pin if necessary, and bend into awire loop (here's how to). Connect the sections together with jump rings. Using the jump rings, attach chain and a clasp. You're done! While a much cheaper (and lovingly handmade) than the original, you should check out the Gemma Redux collection. There are some absolute stunners using stone beads of staggered length that provide loads of inspiration. And let's head outside for the glamour shot. Thanks for having me here today Rebecca! I would love it if any of you head over to Thanks, I Made It to say hello! You can also keep up with me on Pinterest and Bloglovin'! yay! thanks so much for having me here rebecca! !